A few weeks ago I had an epic weekend with the fine folks at Florida Strawberries. They whisked a group of bloggers around Plant City, just east of Tampa, a town famous for growing strawberries in the winter months. We visited the strawberry fields, cooling facilities and even a research farm that studies and creates varietals of the berries. The highlight of the weekend was the food, we enjoyed dishes like Grouper with Strawberry-Basil Compote, Strawberry Caprese Salad and Strawberry Zabaione. I am fairly certain that I was thisclose to turning into a giant strawberry myself. So, you would think I would come home and be strawberried-out. Ah, quite the opposite. I was inspired. What else can I make with strawberries? What other food would strawberries go with? 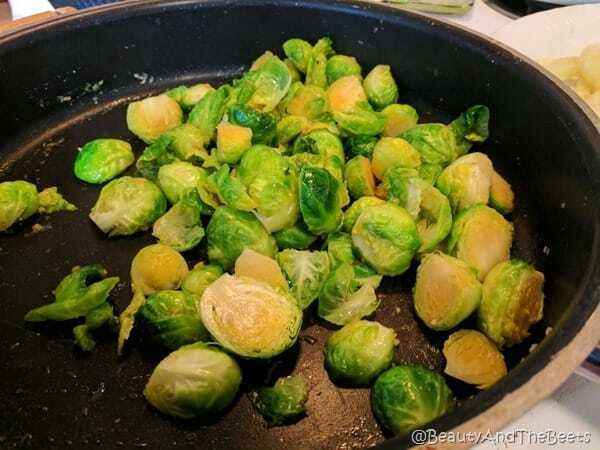 Well, since I am naturally drawn to Brussels sprouts (my favorite food!) I thought about to incorporate berries and sprouts together. 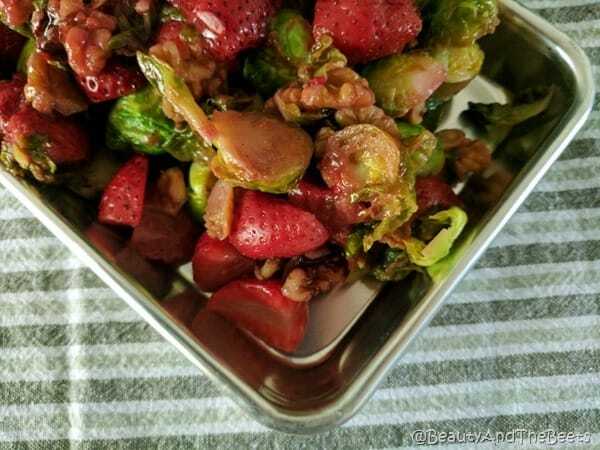 Enter this Sautéed Balsamic Strawberries and Brussels Sprouts dish. Strawberries can get mushy if you overcook them. 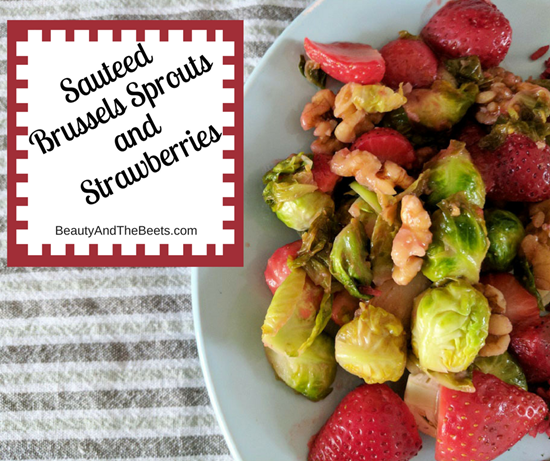 Sauté the Brussels sprouts first and add the strawberries when the sprouts have softened. Strawberries are amazing when sautéed. 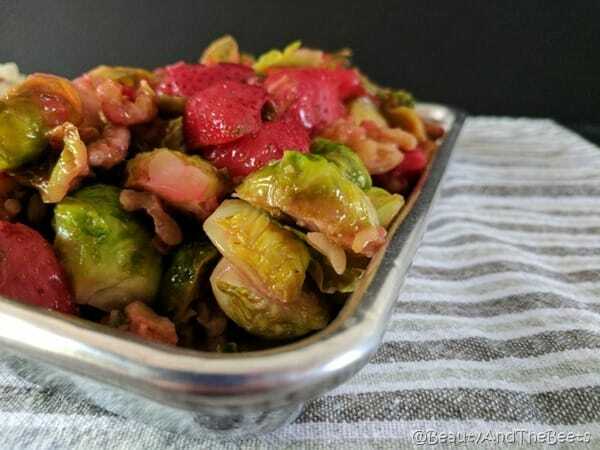 Cooked strawberries are incredibly sweet and a perfect match for the more bitter Brussels sprout. I loved this combo. Strawberries only get sweeter as they are sautéed, as long as they are cooked slightly and not heated for too long. I used a white balsamic vinegar to marinate the berries and opted to use an organic veggie broth instead of an oil. A white blasamic vinegar is less syrupy and sweet than its darker counterpart, allowing the natural sweetness of the strawberries shine through. And the veggie broth only enhances the flavor more. However, oil can easily be substituted in place of the broth. I just prefer less oil in my cooking. That’s just a personal thing. 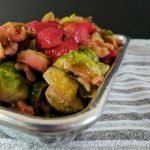 I think this is a perfect side dish to a protein that is less “showy” as the combination of sprouts and berries is so unique and unexpected. 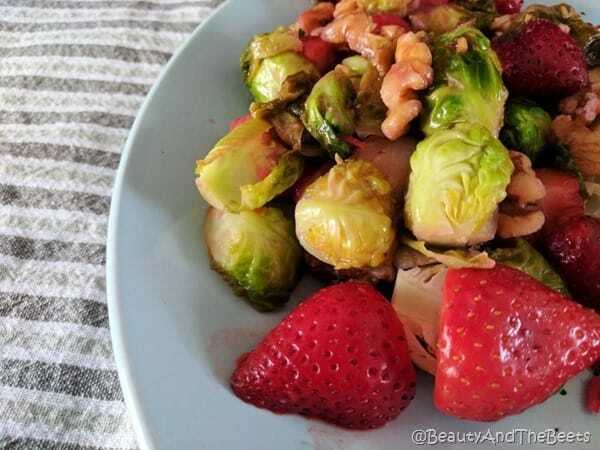 This Sautéed Balsamic Strawberries and Brussels Sprouts is “showy” on its own! Enjoy. Let this unique side dish be the star of your next meal!! 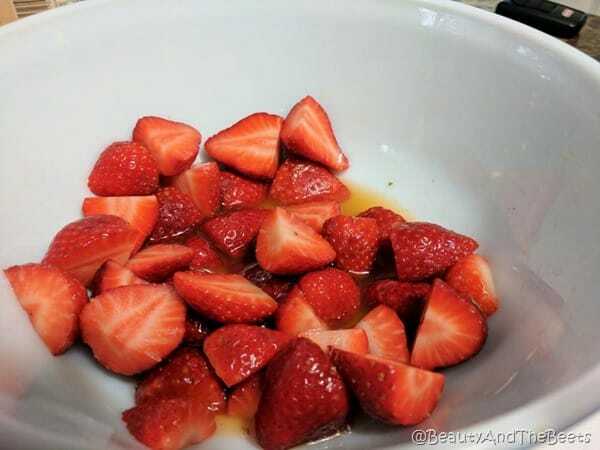 In a medium bowl, mix the strawberries with the veggie broth (or oil if using), lemon juice and the aged balsamic vinegar. Set aside. Heat 2 tbsp. of olive oil in a saute pan over medium-high heat. Add the Brussels sprouts and saute, stirring occasionally for 7 minutes, until the sprouts begin to brown slightly. Stir in the salt, pepper, garlic powder and orange peel. Add the walnuts and stir. Add the marniated strawberries and continue to stir for another 6 minutes. The berries should begin to turn slightly soft, but do not overcook or they will become mushy. This dish sounds absolutely fantastic. 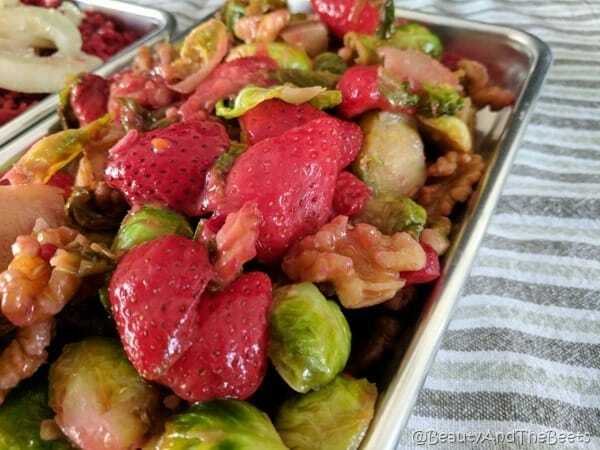 I have had just Brussels sprouts done this way but adding the strawberries would be even better.